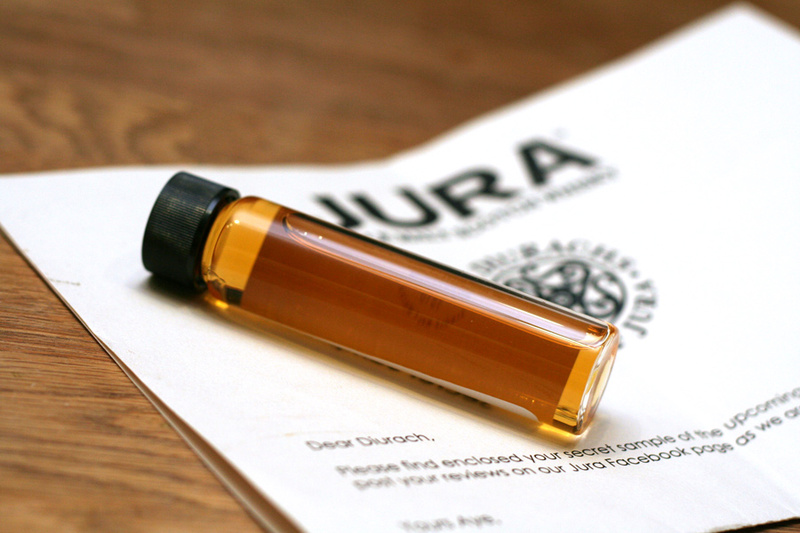 Jura held a small competition recently asking "The secret to a long and prosperous life is…". No knocking back an opportunity I submitted my answer: "Always ensure your bottle of Jura is half full and never half empty". Pure genius! To my amazement I actually won. Unfortunately due to certain laws Jura were not allowed to post me out the sample to Australia. Luckily a fellow club member The Converted was in the UK at Christmas and graciously offered to schlep back the sample bottle to my sweaty palms. This is actually a sample dram of the new Jura Elixir (at the time unnamed and unreleased). I have posted in the past about 2 other Jura expression readily available in Aus, these being Jura Origin, and Jura Superstition and enjoyed them both. Yes I do think I am developing assort spot for this girl. Palms itching and clammy I opened the sample cautiously. Nose: Soft florals on the senses at first then deep wafts of oranges, ginger and salty sea air. It took me a while to recognise the ginger and I had to sit contemplating for sometime before rushing to the fridge to scratch the surface of the ginger root to confirm. Quite extraordinary and oh so appealing. Taste: It all moves to the back of the pallet very quickly with not much on up front. A slight tingle on the tip of the tongue and the lips develops 20 seconds in. The flavour at first is a little barn yardy but the sweetness of florals, zest of the oranges, and the heat of the ginger quickly takes over. This is a whisky that tastes almost just like it smells. I like it a lot. Finish: I would have to say this is a medium finish. The flavour dissipates quickly in the throat and a medium heat fills the chest. Quite velvety going down with enough warmth to keep you comfortable. Balance: This whisky tends to lean on the deep flavours in a more one sided way, but that just makes the pallet smacking for more. Certainly this whisky would go well over a meal or a great starter to a late evening snack. Some would criticise the whisky for this marginal one sidedness but I say to flip them the bird and take their dram for yourself. Well worth a purchase if you can get it. Loving this long after the sample is now gone, if I was to give a dram 6 out of 7 with some real craftsmanship and love obvious form the get go. Thanks to Jura and The Willie's for the sample. Even though it was quiet small, by only a single dram, I am of course appreciative none-the-less for this unique opportunity. Should I have kept the sample unopened and squirrelled it away as a bit of a collectors item? Probably but then I would not have been able to taste it which is what whisky is all about. So heres to hopefully seeing this whisky on the shelves in Aus soon.